Home » VectorVest » Buy Stobart Group #STOB say VectorVest. The stock is undervalued and over the past year has significantly increased EPS. 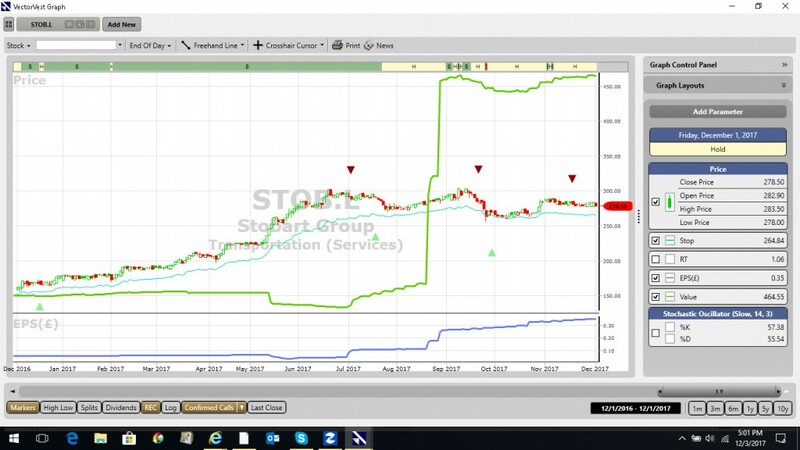 Buy Stobart Group #STOB say VectorVest. The stock is undervalued and over the past year has significantly increased EPS. By Alan Green in VectorVest on 5th December 2017 . Stobart Group Limited is engaged in infrastructure and support service businesses operating in the biomass energy, aviation and railway maintenance sectors, as well as has investments in a national property and logistics portfolio. Its segments are Energy, Aviation, Rail, Infrastructure and Investments. The Stobart Energy segment specializes in supply of sustainable biomass for the generation of renewable energy. The Stobart Aviation segment specializes in operation of commercial airports and includes a joint venture investment in an airline. The Stobart Rail segment specializes in delivering internal and external civil engineering development projects including rail network operations. The Stobart Infrastructure segment specializes in management, development and realization of a portfolio of property assets, and investments in energy plants. The Stobart Investments segment holds non-controlling interests in a transport and distribution business and an aircraft leasing business. The largest shareholders of the business are Neil Woodford and his previous employers Invesco. 65% of the shares are held by large investment houses. The chart of Stobart is shown below in my normal format. The price is in candlestick format while the VectorVest valuation is shown by the green line study above the price. Earnings per share (EPS) is shown in the window below the price. As can be seen the share is undervalued and over the past year has increased EPS significantly. The Growth Potential of Stobart (RV) is an indicator of long term share price appreciation. On a scale between 0 and 2 the RV is 1.72 which is excellent. The Growth to PE ratio (GPE) is on a level of 4.5 which indicates that the share is mispriced and undervalued. The share pays a dividend of over 4% and has an excellent record of paying and growing the yield. Since being revalued by VectorVest in August 2017 the share has traded sideways and eagle eyed technical analysts should see the 5 wave “flag” pattern which looks to be complete soon. Superimposed on the Stobart chart is the performance of the overall market as measured by the VectorVest Composite of the London market. This is an equally weighted index of all the 2165 shares that VectorVest follows on the LSE and AIM. The red and green triangles on the chart represent the signals from the most conservative VectorVest market timing model known as Confirmed Calls. At VectorVest we believe that the most important thing to know is whether the market is moving up or down. Everything follows from that. As you can see Stobart starts to move when the overall market turns positive as shown by the green triangle on the chart. Since the 17th November the overall market has been trending downwards as defined by the Confirmed Call market timing system and the advice on VectorVest has been to stand aside. That’s been excellent advice. Should the overall market print a new BUY signal (green triangle) and the recommendation on the share change to BUY then the probability of a trending and bankable move upwards looks excellent. Summary: Nothing to do at present until if and when the overall market records a new BUY signal. Consider the share if STOB.L breaks upwards through 3 pounds and prints a BUY recommendation. Readers can examine trading opportunities on STOB and a host of other similar stocks for a single payment of £5.95. This gives access to the VectorVest Risk Free 30-day trial, where members enjoy unlimited access to VectorVest UK & U.S., plus VectorVest University for on-demand strategies and training. Link here to view.